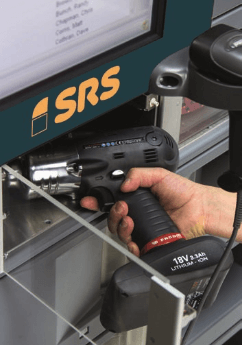 The letters SRS stand for Stock Rentabilidad y Servicio (Stock Profitability and Service), our ultimate goal in fastener management. 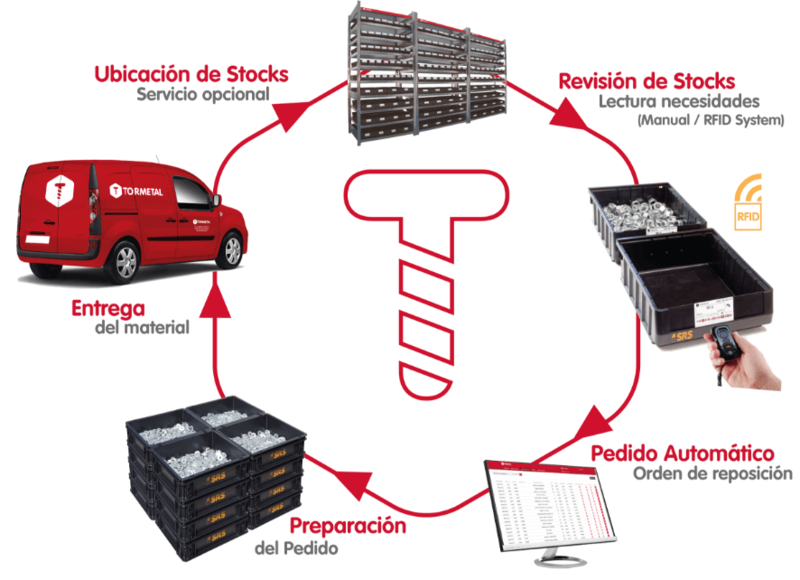 Why use a Kanban system for the consumption and supply of fasteners? The screws and extensive range of fasteners comprising this product group are the most representative of what are known as C-PARTS. 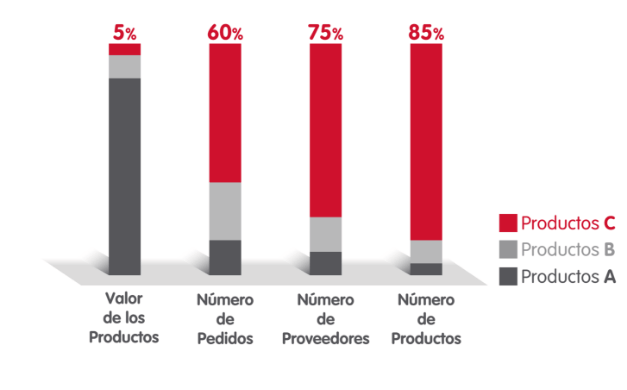 85% of all parts used by original equipment manufacturers are C-PARTS but their cost usually represents no more than 5% of the global cost. Our experience over more than 10 years of implementing SRS systems has taught us that the C-parts costs battle is won by reducing their management and leaving it in the hands of an expert such as TORMETAL. 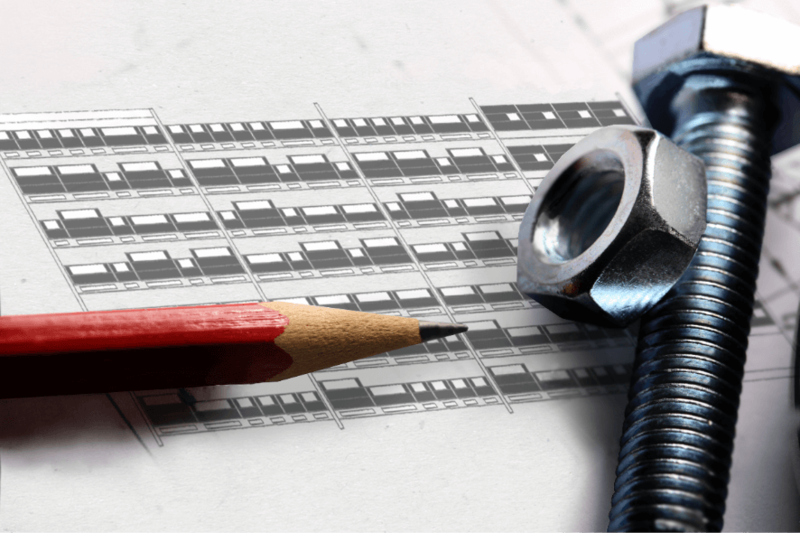 Through our management service, the global supply of fasteners is unified in one supplier. We search for the best solution and the most suitable system to guarantee a reliable product, through efficient, technologically-advanced systems, within the shortest term and at the right price. Not particularly strategic but essential for the end product. Large number of orders, suppliers and articles. Management costs higher than the value of the products. Low cost products with prices less than €18 per unit. Greater difficulty in predicting demand. The objective is to concentrate suppliers. The original system of Japan aims at the total availability of the product at the place of production “just in time”, just when it is needed. The most implanted system is based on the “TWO BIN KANBAN”, double bucket delivery method, which guarantees stock availability for a given production period and level. Carrying out this requires close client-provider collaboration in order to assess existing gaps and needs Our adaptability allows us to adapt the technologies and replacement systems to the specific characteristics of each client. This method involves a detailed study of each of the references to include in the system, to determine the batch, type of packaging and more suitable location. This allows you to ensure a system that is efficient and tailored to your needs. Product needs in Kanban systems are managed through two bins adapted in terms of product size and quantity. Each bin is identified by means of a label which, depending on the technology used, will be a barcode or RFID with all the necessary data for replacement, the article, code, supplier, client reference, batch and replacement quantity. As already mentioned above, the SRS system divides each of our references into two bins, with each bin containing a sufficient quantity of the reference so that when the contents of the first bin run out, it can easily be replaced before the contents of the second bin have been used up. To guarantee the cycle and efficient management, a replacement period of 15 days is recommended, which can be adapted based on needs. 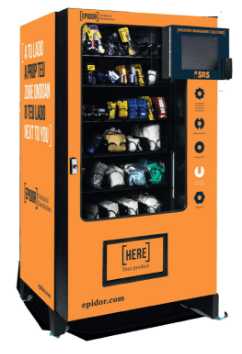 Every time the material in one bin runs out, it is put at the rear of the location, placed on a shelf for empty bins or the card with the article label is removed. From time to time the empty bins are controlled in their locations by reading the identification label. Basically, two systems are used: barcode reading equipment or an RFID radio frequency ID system. The data is automatically transferred to Tormetal and a copy is sent to the client, for them to see the needs detected in the warehouse. During this process we can incorporate the result in a custom format or through data columns that are compatible with the client management programmes. When the client confirms the order, we then prepare it. Whenever Tormetal implements an SRS service, it keeps a stock in its warehouse that guarantees the replacement flow designed for the articles consumed by the client. This reserve programme, together with permanent control over the evolution of consumption and its resizing, guarantees an efficient, safe and timely supply. 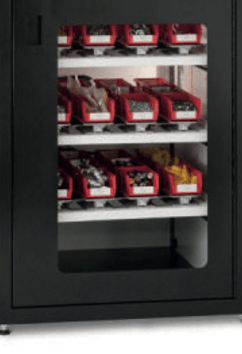 Tormetal provides the necessary elements for its start-up, the shelves if the client has no appropriate shelves, bins and reading and data transmission equipment. 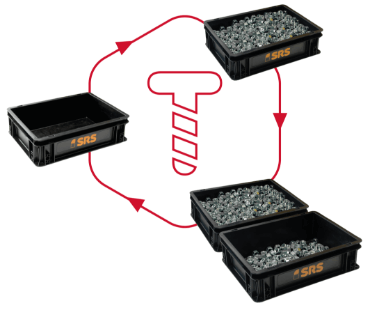 The implementation of the SRS system bears an initial implementation cost and a fee or a rental payment for the elements used, which in all cases are clearly offset by the savings generated by the service in the global management of the client’s fasteners. Tormetal assumes the management of all the references included in the Kanban, maintaining a safety stock to guarantee permanent stock availability. To guarantee the operation and safety of the system, the client signs a contract for a supply period, with all the service terms and conditions agreed. Our specialised sales staff will study your needs and install the most appropriate system swiftly and speedily. Saving is easy when efficiency is money. We offer alternative operating systems designed for each of our client’s needs using variants of the Kanban system or different methods and technologies. The method used is the Kanban method with a location label and barcode reading system. In this case, instead of using bins, the supply is made in standard cases. The storage system may be single (one case) or double (two cases). Stock control by means of barcode readers is usually performed by the clients, who receive and relocate the goods in their warehouse. Through the INVENTORY MANAGEMENT SOLUTIONS programme and using other group companies, we offer complementary or alternative solutions to cover all your needs. Solutions for PPE, Abrasives, Chemicals, etc.